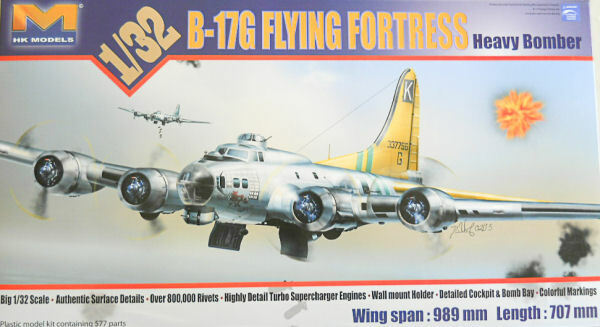 HK Models has released a real beauty with the 1/32 scale B-17G Flying Fortress heavy bomber. This kit is comprised of 577 parts with a small fret of photo-etch for the seat belts and engine oil cooler inlet screens. Thirty trees of parts are provided in the kit box. This kit has very fine recessed and raised detail to represent the flying fortress in all its glory, many open doors, flap wells and panels have ejector pin marks that will need to be fixed. I didn't notice any sink marks or flaws with my kit. The decals with this kit are glossy and sparse, and they only give you the option to build one aircraft. Included is a fully detailed interior and bomb bay. The flight deck and bombardiers stations are well detailed so that the top portion of the fuselage can remain unglued to reveal all the interior components. Decals are provided for the main instrument panel. Clear parts are thin and very clear. Each engine and propeller is comprised of 10 individual parts. You can build the kit with either the gear up or down. The main landing gear tires appear to have bulging to them. This kit when built measures nearly 39 inches (989mm) for the wing span and 28 inches (707) for the fuselage. It's obvious by the design of this kit that HK Models will be releasing other variants of the Flying Fortress. The wall mounted stand included with this giant kit is a great way to display and store this kit. K - Front Fuselage halves, interior parts and guns.